Luba Freedman. Classical Myths in Italian Renaissance Painting (Cambridge and New York: Cambridge University Press, 2011). Valentina Locatelli. Metamorfosi romantiche. Le teorie del primo Romanticismo tedesco nel pensiero sull’arte di Giovanni Morelli (Pasian di Prato: Campanotto Editore, 2011). Jill E. Blondin. “Shelter from the Storm: S. Maria del Buon Aiuto in Rome,” in The Chapels of Italy From the Twelfth to the Eighteenth Centuries: Art, Religion, Patronage, and Identity, ed. L. H. Zirpolo (Woodcliff Lake: Aurora, 2011). Nicola Camerlenghi, “Interpreting Medieval Architecture through Renovations: The Roof of the Old Basilica of San Paolo Fuori le Mura in Rome,” in Approaches to Byzantine Architecture and its Decoration: Studies in Honor of Slobodan Curcic, ed. M. Johnson and R. Ousterhout (Ashgate, 2011), 259-6. Arnold Victor Coonin. “Dedicated Spaces: An Introduction to Tuscan Chapels,” in The Chapels of Italy From the Twelfth to the Eighteenth Centuries: Art, Religion, Patronage, and Identity, ed. L. H. Zirpolo (Woodcliff Lake: Aurora, 2011). Luba Freedman. “Mercury à la David in Italian Renaissance Art,” Annali della Scuola Normale Superiore di Pisa. Classe di Lettere e Filosofia series 5, 3/1 (2011): 135-57. Anne Leader. “The Church and Desert Fathers in Early Renaissance Florence: Further Thoughts on a “New” Thebaid,” in New Studies on Old Masters: Essays in Renaissance Art in Honour of Colin Eisler, ed. J. Garton and D. Wolfthal, (Toronto: Centre for Reformation and Renaissance Studies, 2011), 221-34. Areli Marina. “From the Myth to the Margins: The Patriarch’s Piazza at San Pietro di Castello in Venice” Renaissance Quarterly, Vol. 64, No. 2 (Summer 2011), pp. 353-429. Catherine Carver McCurrach. “Renovatio Reconsidered: Richard Krautheimer and the Iconography of Architecture.” Gesta 50/1 (2011): 41-69. Carolyn C. Wilson. 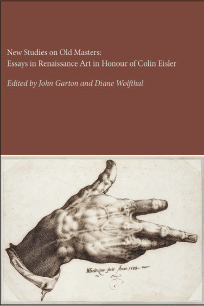 “Saint Joseph in the Early Cinquecento: New Readings of Two Parmigianino Drawings and a Rediscovered Bedoli,” in New Studies on Old Masters: Essays in Renaissance Art in Honour of Colin Eisler, ed. J. Garton and D. Wolfthal, (Toronto: Centre for Reformation and Renaissance Studies, 2011), 329-49. Carolyn C. Wilson. “Joseph as Mary’s Champion: The Distinctive Connection between the ‘Madonna del Giglio,’ the ‘Compagnia di San Giuseppe,’ and the Church of San Giuseppe in Florence,” Joseph of Nazareth through the Centuries, ed. J. Chorpenning (Philadelphia: Saint Joseph’s University Press, 2011), 77-102. Carolyn C. Wilson. “Georges de La Tour’s Two Saint Josephs: Theology, Veneration, and Connections with Renaissance Italy,” in Georges de La Tour: Adoration of the Shepherds, Christ with St. Joseph in the Carpenter’s Shop, ed. V. Merline, D. Storti, and D. Salmon (Milan: Skira, 2011), 101-07. Lila Yawn. “The Italian Giant Bibles, Lay Patronage, and Professional Workmanship (11th-12th centuries),” Cahiers Electroniques d’Histoire Textuelle du LAMOP (Laboratoire de Médiévistique Occidentale de Paris, Centre national de la recherche scientifique), 3 (2010). Lila Yawn. “The Italian Giant Bibles,” in The Practice of the Bible in the Middle Ages, ed. Susan Boynton and Diane Reilly, New York: Columbia University Press, 2011, pp. 127-156.